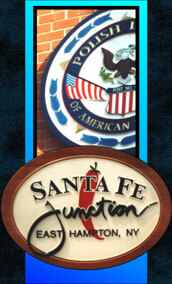 We can produce a wide variety of signs from your design or ours. We specialize in sandblasted or V-carved signs, custom dimensional signs, dimensional letters and graphics in many different materials. We also offer full color digital printing on our state of the art Scitex flatbed UV printer. We can ship anywhere direct to you through our affiliation with www.goinpostal.com. Call or email us today for a price! Just send us your artwork by email or fax and we will fabricate your sign and ship it to you, usually within two to three weeks. We also print full color digital banners and are one of the largest manufacturers of custom photographic stand ups done through our sister company, www.lifesizegreetings.com. There we offer outdoor holiday decorations along with giant greeting cards.